Deadline: This project’s deadline is Monday, January 28, 2019, at 11:59pm (that is, just before midnight) wherever you are on. It was posted in the afternoon, California time, on Thursday, January 24, 2019. Step 1: This week’s Disquiet Junto project is the third in a sequence that explores and encourages asynchronous collaboration. This week you will be adding music to a pre-existing track, which you will source from the previous week’s Junto project (disquiet.com/0368). Note that you are finishing a trio: you’re creating the third part of what two previous musicians created. Keep this in mind. Step 3: Record a short piece of music, roughly the length of the piece of music you selected in Step 2. The source track should have one musical line running in the left channel and another in the right. You should pan your addition, the final third of this trio, in the center. When composing and recording your part, do not alter the original pieces of music at all. To be clear: the track you upload won’t be your piece of music alone; it will be a combination of the track from Step 2 and yours. Step 4: Also be sure, when done, to make the finished track downloadable, because it may be used by someone else in a subsequent Junto project. 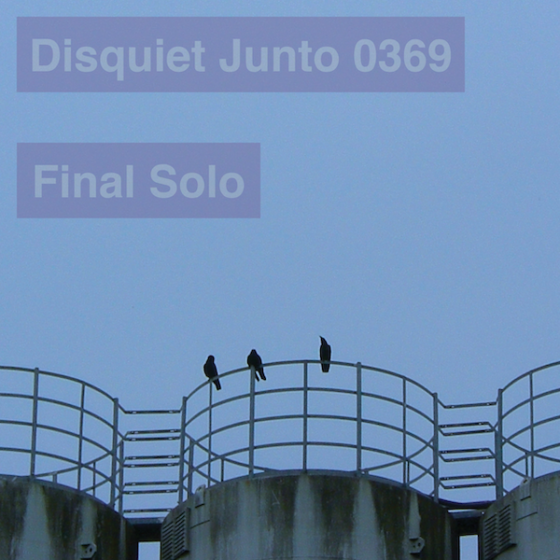 Step 1: Include “disquiet0369” (no spaces or quotation marks) in the name of your track. Step 2: If your audio-hosting platform allows for tags, be sure to also include the project tag “disquiet0369” (no spaces or quotation marks). If you’re posting on SoundCloud in particular, this is essential to subsequent location of tracks for the creation a project playlist. Title/Tag: When posting your track, please include “disquiet0369” in the title of the track, and where applicable (on SoundCloud, for example) as a tag.